One of the best things about riding a bike in heavy traffic is being able to overtake cars on the left hand side. Most capital cities have arterial roads that turn into part-time car parks during rush hour, especially when cars are queuing to get over a bridge or similar bottleneck. 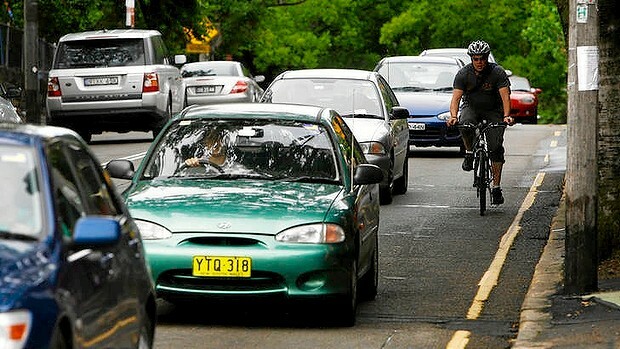 In ideal conditions, a commuter cyclist can pass literally hundreds of cars, and perhaps even be showered and at their desk before overtaken motorists have finished finding a place to park. But being on the left can contain significant dangers. I haven’t seen full police details of the incident, but Monday’s horrific accident in Melbourne, where a cyclist was run over by a truck, could be a reminder of the risks of being alongside a vehicle. Bicycles have a unique right to pass other vehicles on the left, as described in the NSW road rules. Bicycle Network Victoria has some additional advice on the issue. It’s not a well-known rule among motorists, which can lead to misunderstanding and even anger about perceived lawlessness. Some motorists also complain that the rule means they have to pass the same cyclist on multiple occasions. Maybe, but the question is, once they’ve passed the cyclist, why don’t they zoom off, never to be seen again? More than likely, the motorist is repeatedly being held up by traffic lights or the car in front of them. They are still in the same place in the traffic, it just takes a bit longer to move around the bicycle to get there, and frustrations about traffic congestion in general are pinned on the cyclist – not the other cars. Here’s an informal list of things I try to remember when “undertaking”. Mind the gap. Make sure you will be able to get to the other end of the vehicle in front of you, and that there will be space for you when you get there. If a space is too narrow for you to cycle normally, it’s probably best not to go. Go slow. Sure, if you’re on a big road shoulder you can pick up the pace, but if you’re threading carefully, moderate your speed. Don’t go flying through narrow spaces – a lot can go wrong in a hurry. Watch out for left turners. Especially if they don’t indicate. As explained by Bicycle Network Victoria, the law says you can go past them if they’re indicating but not yet turning. But you wouldn’t want to be trapped alongside if they start moving. Dooring double danger. Not only do you have to be careful of doors opening on parked cars to the left, but there’s a chance someone might fling open a passenger door of the car you’re passing on your right. Beware trucks and buses. There are so many reasons to be cautious with large vehicles. The driver likely can’t see you. The huge wheels can catch you. Longer vehicles take more time to get past. Wider vehicles tend to be closer to the kerb, and if they’re moving on a road with a bend, they create a squeeze point. And if the vehicle starts moving and turns left, any cyclist alongside could be in a world of trouble. Watch for pedestrians. When a road turns into a car park, some pedestrians thread through the stationary cars rather than walk to an intersection or zebra crossing. They probably aren’t looking for your kerb-crawling antics, especially if sneaking past a big 4WD. Lastly, I work on being courteous to motorists, and staying well clear of wing mirrors. And if there’s a couple of cars between me and a light, and beyond that an open road, I figure I don’t have to move to the front just because I can.